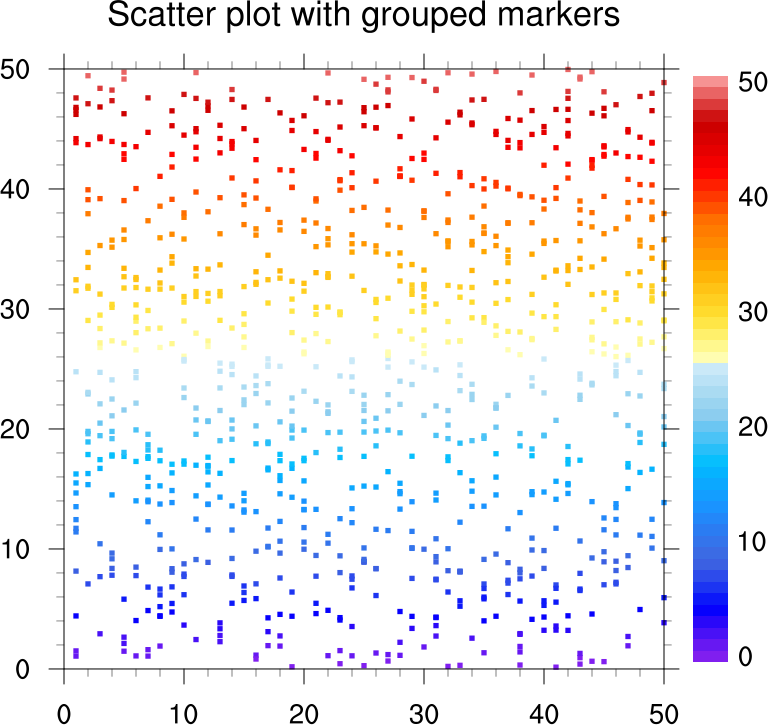 This suite of examples shows how to create scatter plots. Some of these are basic XY plots in "marker" mode. Others are drawn using polymarkers. You can use the NCL table of predefined markers, or you can define your own using the NhlNewMarker function. 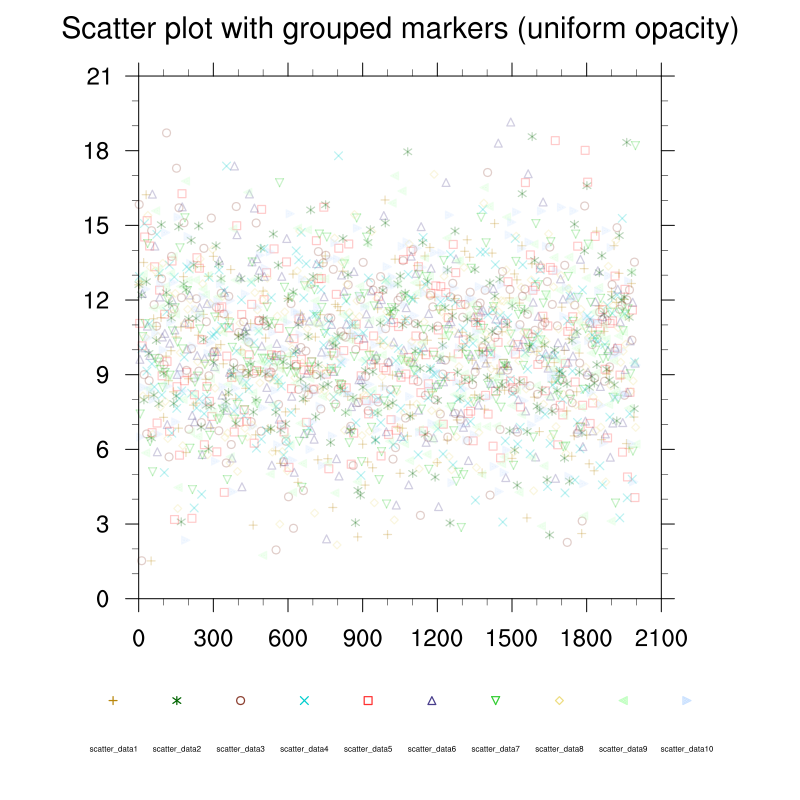 scatter_1.ncl: Basic scatter plot using gsn_y to create an XY plot, and setting the resource xyMarkLineMode to "Markers" to get markers instead of lines. 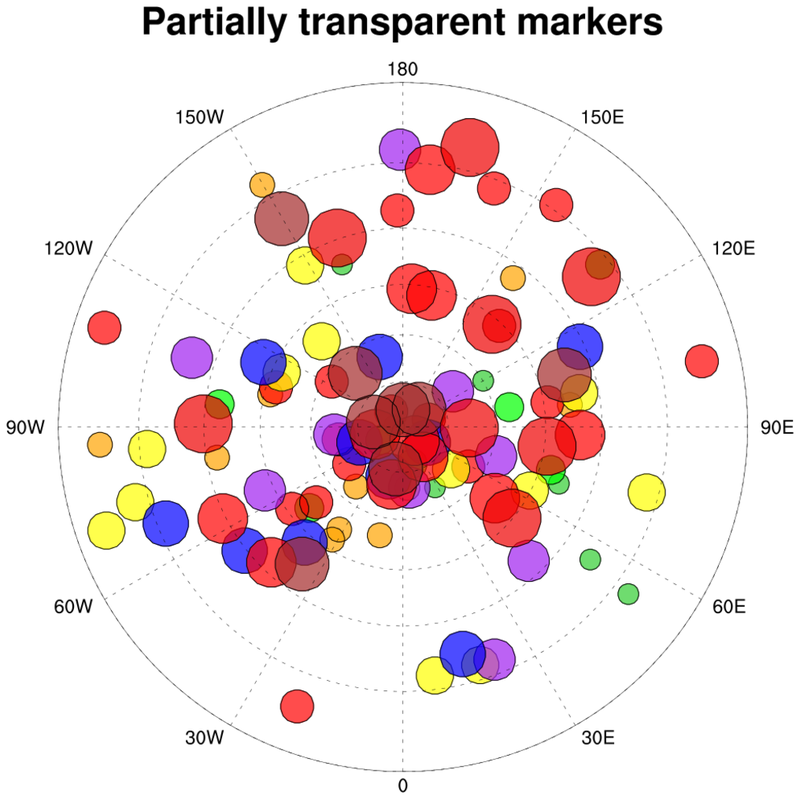 The appearance of the markers are changed using xyMarker to get a filled dot, xyMarkerColor to change the color, and xyMarkerSizeF to change the size. scatter_2.ncl: This is similar to the previous example, except NhlNewMarker is used to create a new marker (clover, character 'p' in font table #35). You can create your own marker using any character from any of NCL's font tables. 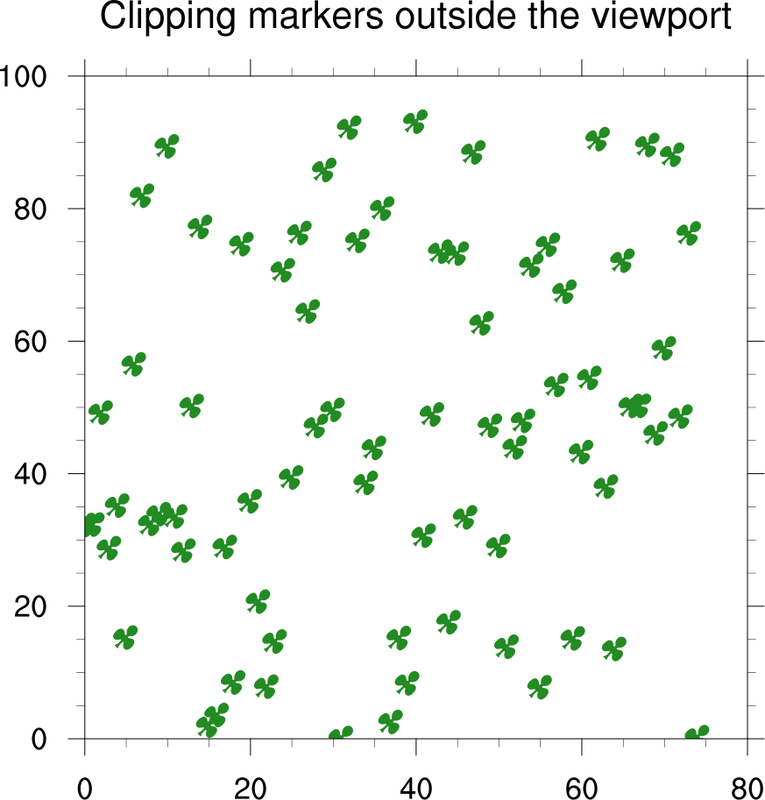 The second frame of this example shows how you can clip the markers by setting vpClipOn to True. 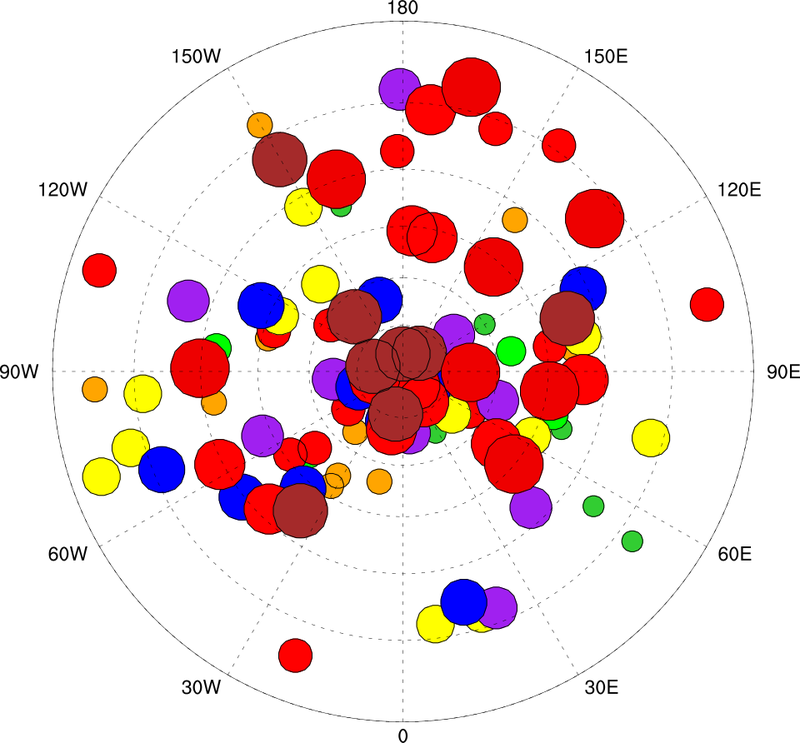 scatter_3.ncl: This example shows how to create a scatter plot over a map. The gsn_csm_map function is used to create and draw the map, and then gsn_polymarker is used to draw markers on top of the map. In the second frame, the map is zoomed further in, and the markers are "attached" to the map using gsn_add_polymarker. This means you won't see the markers until you draw the map. 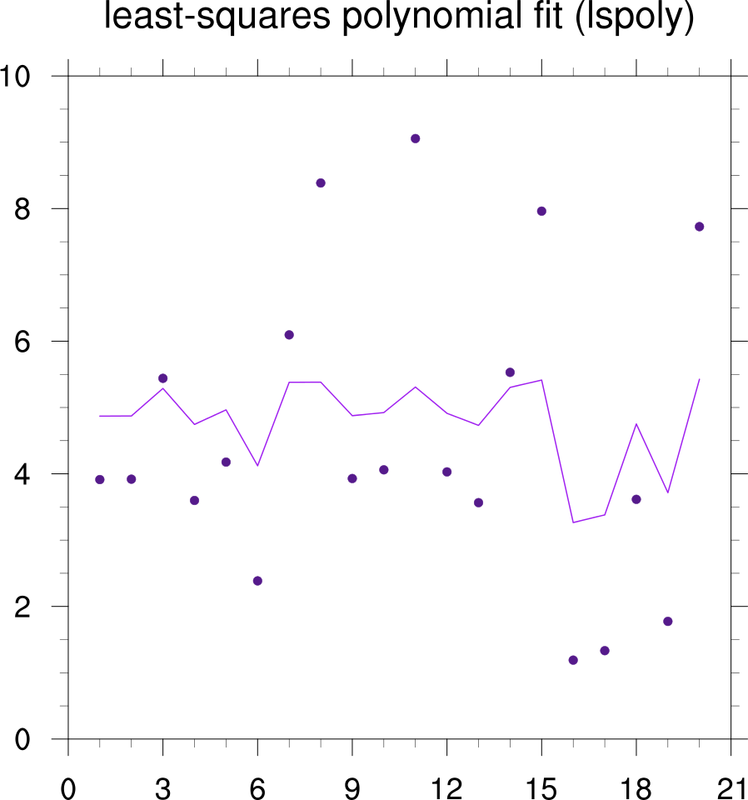 This is the preferred method, especially if you plan to resize or panel this plot later. 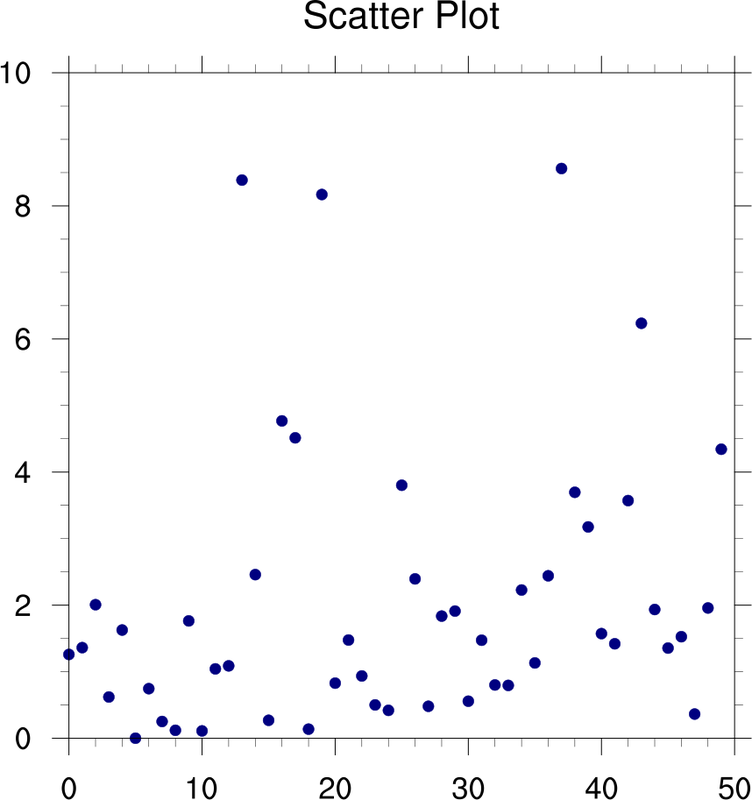 scatter_4.ncl: Demonstrates a scatter plot with a regression line. 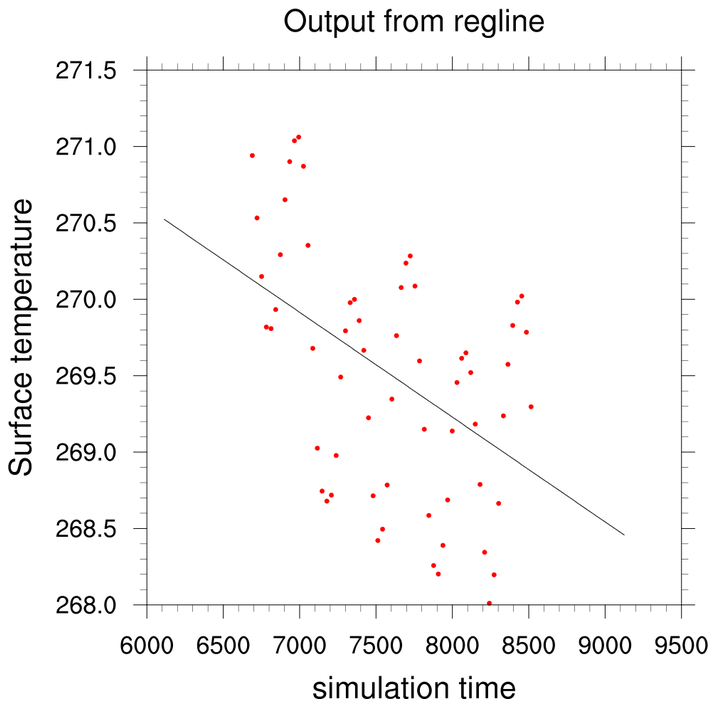 The function regline calculates the least squared regression for a one dimensional array. scatter_5.ncl: Demonstrates how to take a 1D array of data, and group the values so you can mark each group with a different marker and color using gsn_csm_y. The function nice_mnmxintvl is used to create a nice set of equally-spaced levels through the data. You can then create a 2D array, where the leftmost dimension represents each level and the rightmost dimension the number of values grouped in that level. xyMarkers and xyMarkerColors are used to to define different colors and markers for each group. 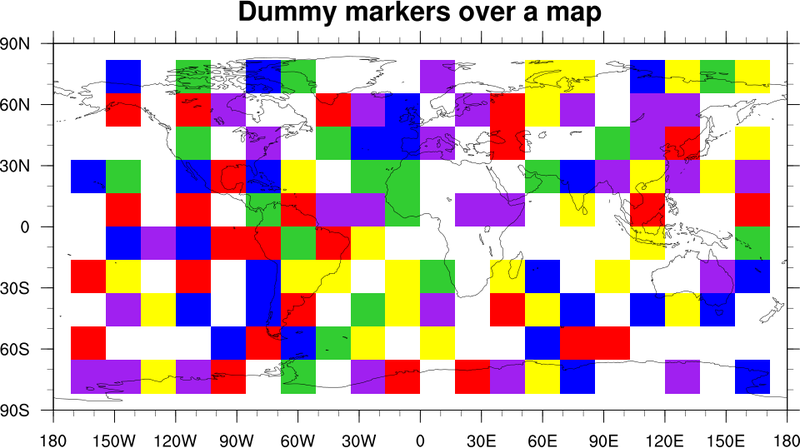 scatter_6.ncl: Demonstrates how to draw outlined, filled markers over a polar map plot. The gsn_add_polymarker function is called twice for each range of values: once to draw a filled dot (gsMarkerIndex=16) and one to draw an outlined dot (gsMarkerIndex=4). This gives the appearance of outlined markers. 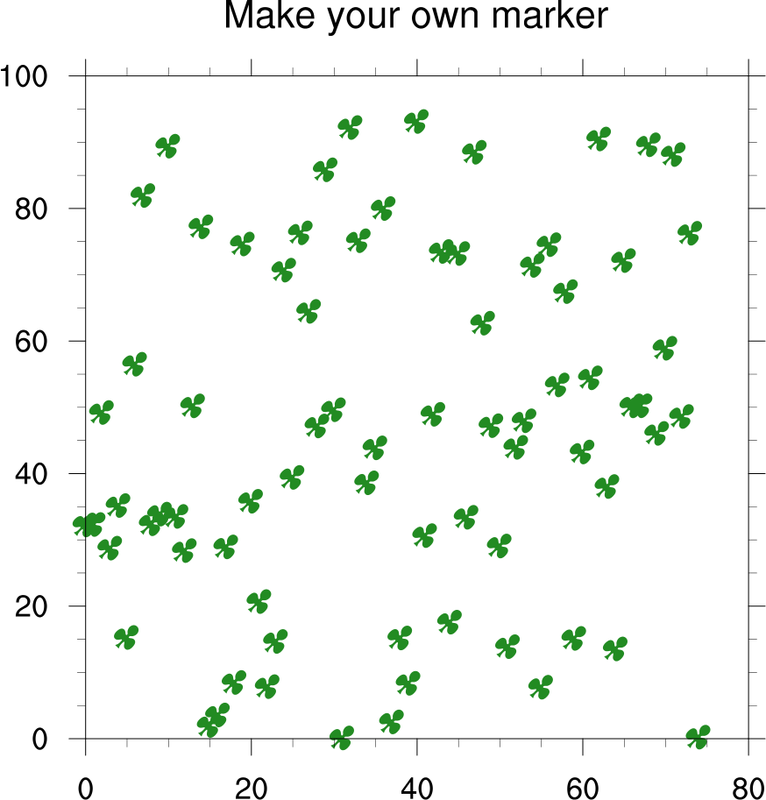 The marker sizes (gsMarkerSizeF) range in value from 0.025 to 0.075. The random_uniform function is used to generate random data. newcolor_4.ncl: This example is identical to the previous scatter_6.ncl example, except it uses the new gsMarkerOpacityF resource introduced in NCL 6.1.0 to make the filled markers partially transparent. Only the second frame is shown here. Notice how markers that are obscured in the first version are visible in the second plot. scatter_7.ncl: Demonstrates how to draw hollow markers of different sizes and colors, and then use labelbars, markers, and text to create a legend. The original version of example was contributed by Larry McDaniel of IMAGe / NCAR. It was pared down significantly to remove all the data processing calls. 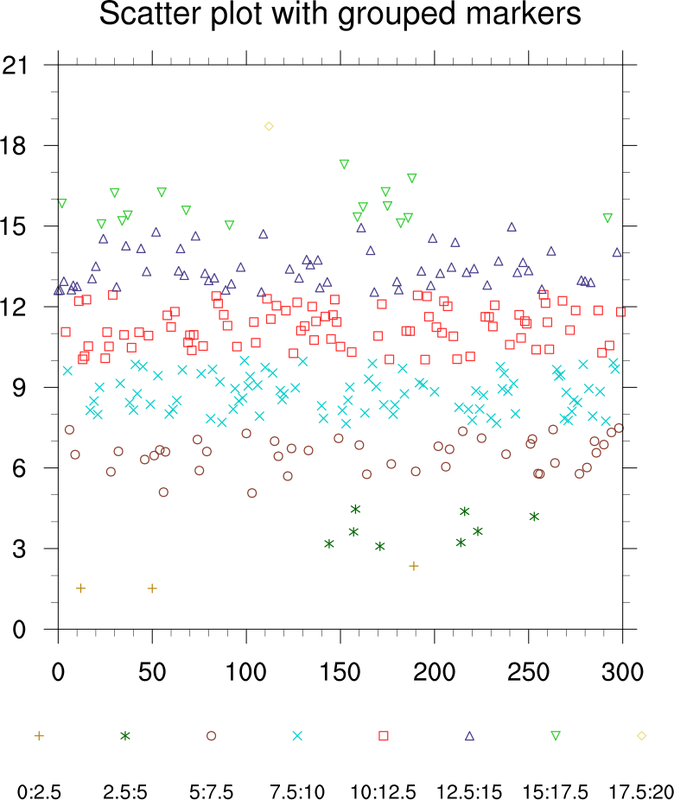 scatter_8.ncl: Demonstrates how to draw filled square markers of different colors, and then attach a labelbar to the outside of the plot. 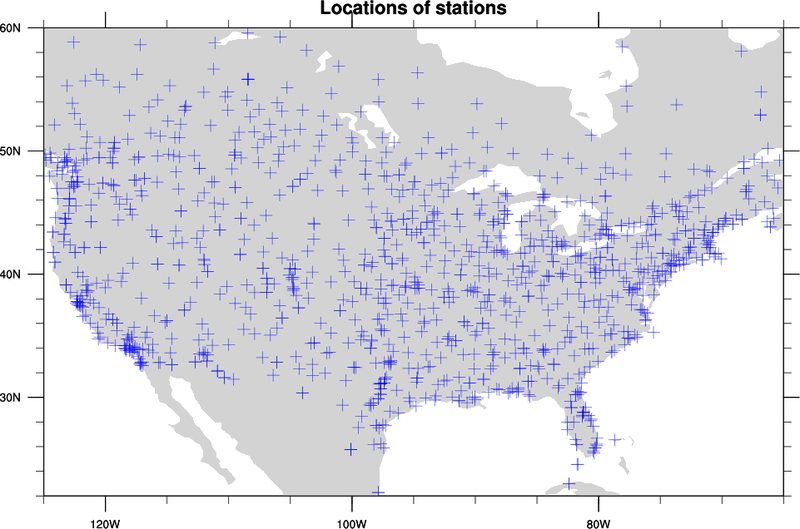 scatter_10.ncl: Demonstrates how to overlay a scatter plot (of filled squares) on a map plot, when the scatter plot is not in lat/lon space. 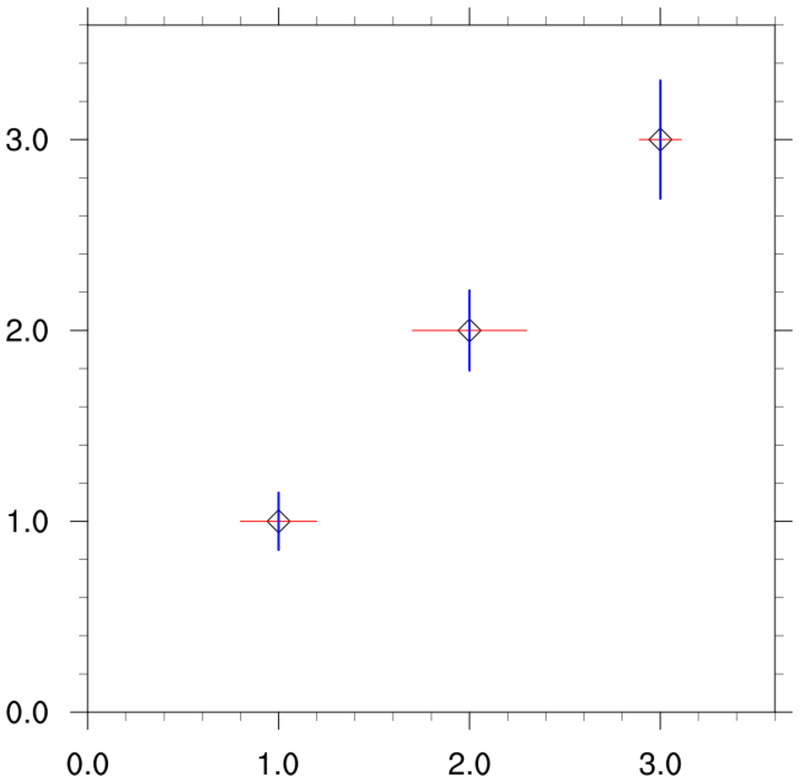 The key is to use gsn_csm_blank_plot to create a canvas for drawing the filled polygons, making sure that the four corners of the blank plot correspond with the four corners of the cylindrical equidistant map plot that is created. You then set tfDoNDCOverlay to True to make sure that when the blank plot is overlaid on the map plot using the overlay procedure, it simply lines up the corners of the two plots and does the draw. 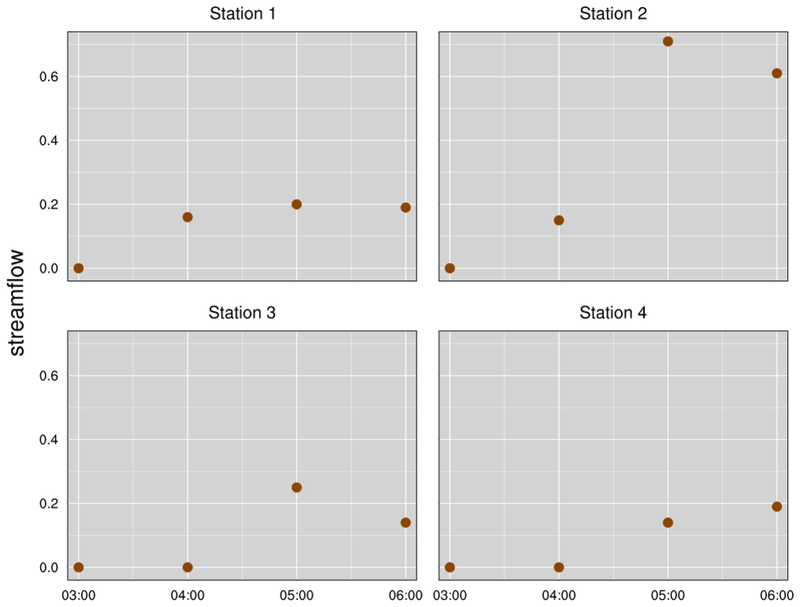 scatter_12.ncl: Draw separate error bars in the x and y directions. Based on an ncl-talk question (11/2016) by Rashed Mahmood. He 'self-answered' his question with some example code. Alan Brammer (U. Albany) created the x and y separate procedures shown in the script. 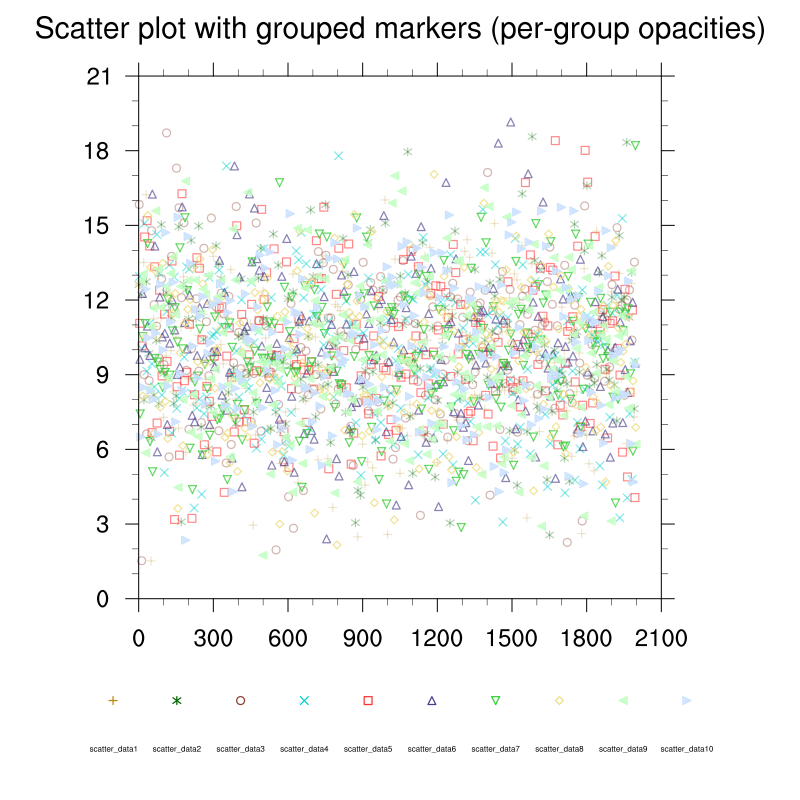 scatter_13.ncl: This script shows how to draw a more custom scatter plot with the plot area filled in gray and white grid lines added. 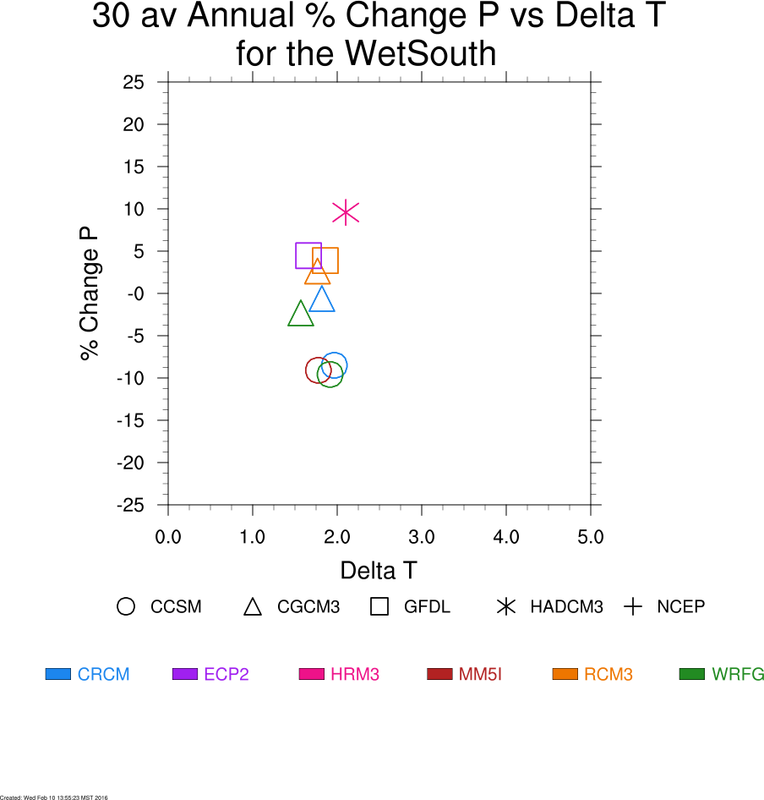 This plot uses the same data and is similar to bar_22.ncl on the bar plot page. In order to draw the white grid lines under the dots, the tmGridDrawOrder resource must be set to "PreDraw". This resource was added in NCL V6.5.0. If you try to run this script with NCL V6.4.0 or earlier, the grid lines will show up on top of the filled dots and you'll get a warning that the resource is not valid.